Cheeseburgers in space. It could be the futuristic follow-up to a Jimmy Buffett song, but actually it’s a proposal on the table for Russia’s space program. The Associated Press reported yesterday that the Russian Academy of Sciences’ space food division was willing to consider the traditional American fast food meal for its own cosmonauts. Apparently, the idea of space hamburgers came from the head of Burger King in Russia who suggested that Russia’s space program should consider adding cheeseburgers in tubes to their astronauts’ offerings. “We're not opposed to this possibility, especially if the food tastes good and the cosmonauts like it,” Lyudmila Pavlova, the head of the space food division, said. Unfortunately, she didn’t clarify what a “cheeseburger in a tube” even is. Maybe Whoppers aren’t good space hamburgers? Another question: Will this situation lead to a Cold War–esque space food arms race? If the Russians get Burger King in space, the Americans have no choice but to try to outdo them. Shake Shack? Chipotle? 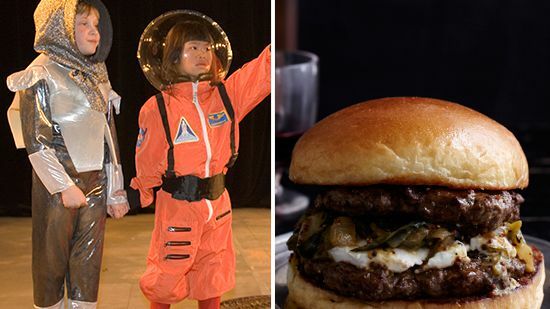 What is David Chang doing and how would he feel about living on the International Space Station?